The Xiaoyao site is also called the Wandaoling site which is located in 200 meters south away from the Xiaoyao village, Nanguan town, Lingshi Country, Shanxi Province. It is on the Wandaoling ridge which is the junction of Jinzhong Basin and Linfen Basin. It is 790 meter above sea level, and high in south and low in north. 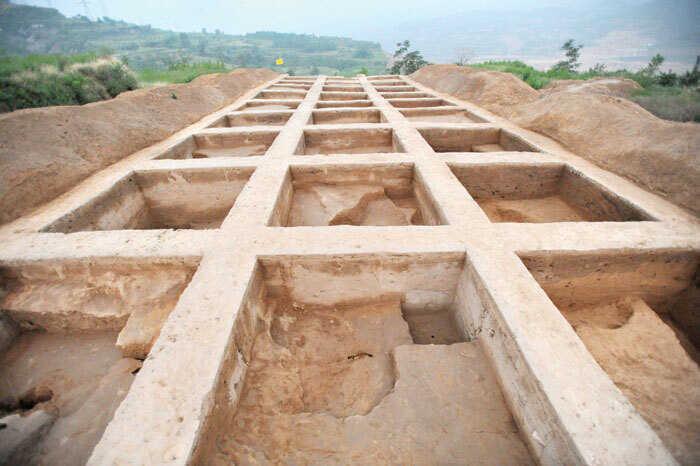 In May 2012, in order to coordinate the capital construction, the Archaeology Institute of Shanxi province amply investigated this site and found it covered more than 1000 square meters in area. From May to August of 2012, the undestroyed area at the site was comprehensively drilled and excavated, and disclosed a settlement which had rich cultural deposit, including the Yangshao Culture and the Erlitou Culture, etc. The main features discovered in this excavation are: a house ruin, a pottery kiln and 40 ash pits dating to the late Yangshao Period, 3 tombs and 5 ash pits dating to the Erlitou Period. Complex intrusion and overlap relationships occurred on these features, which is significant for studying the chronological sequence of the artifacts. According to the stratigraphical sequence and the unearthed artifacts, this site could be dated to two periods, the early period dating to the late Yangshao, and the later period dating to the Erlitou period. The majority of the potteries dating to the late Yangshao were sand tempered gray potteries and the minority was sand tempered red potteries, temperless gray potteries and temperless red potteries. Moreover, a few painted pottery shards and white pottery shards were also found. The decorations on the artifact surface are mainly chords pattern, additional heap pattern, and then plain pattern and basket pattern, then string pattern and a small number of nick pattern, square pattern and ring pattern. In addition, a small number of painted pottery shards existed. Sand tempered jars had cockscomb-shaped handles, which mostly lie between the rim and the maximum diameter of the jar. The artifacts could be categoried into sand tempered gray pottery jars with folded rim and flat bottom, temperless gray pottery jars with broad shoulder and basket pattern, sand tempered gray pottery bowls with flowers rim bottom, temperless round bottom dou bowls with brown embryos and black coating, temperless gray pottery bottles with flat bottom and horn mouth, tempered gray pottery urns, sand tempered gray pottery jia tripods, sand tempered gray pottery tongue-shaped basins with flat bottom etc. Moreover, there were chipped pottery knives, pottery weaving wheels and so on. Stone tools included yue knives, axes, shapes, chisels, cobbles, stone balls and so on. Also perforated shell decorations and bone hairpins and bone awls were discovered. Through pottery analysis, it can be seen that the date of these artifacts is different from that of the Yijing site’s, but the date of the sand tempered jars from this site is similar with those from that of Xiaoyi Linshui and that of the section 1 of Phase I of Baiyan. The typical artifacts are horn mouth-shaped jars with bridge-shaped ears and folded sand tempered jars with double handles. But the painted pottery shards from the Yijing site and jars from the Wuyangtai site were not found at this site. In addition, there were no pointed–bottom bottles or tri-pods. The simple combination of artifacts had a strong continuousness and an obvious local characteristic, indicating it should be a new archaeological cultural type or could be called Baiyan I culture. All the tombs could be dated to the Xia Period. The grave goods were simple and all were sand tempered gray pottery small jars. But the three well preserved tombs were almost laid out in rows and were possibly belonged to a family. The skeleton of this tomb owner was uncompleted, and was characterized by the incompletion of the left carpal bones, metacarpal bones, phalanx. In another tomb, there were not the left ulna, radius, carpal bones, metacarpal bones and phalanx. It is possible that a body-cut funeral used to be popular there. The small jars with double handles were the same as those from the Dongxiafeng site, Xia county. Convergent mouth jia tripods, open mouth jia tripods and yan tripods were the same as those from the Dongtaibao site, Taiyuan, however, the convergent mouth urns and li tripods have local features.